OK, there are a lot of minis lately. The reason is now I have about two hours a week, mostly in the evenings, to do hobbies, and I try to do things that are not involving toxic things, such as plastic glue or oil paints, since I prefer to stay close to my daughter. So now is the time to finish all those older projects, and more importantly, learn new techniques. I’ve featured a lot of Grim Skull stuff before on this blog; I do like the aesthetics of their models, and some are actually cheaper than the official Wargaming minis. This particular set features the Thousand Sons Terminators. 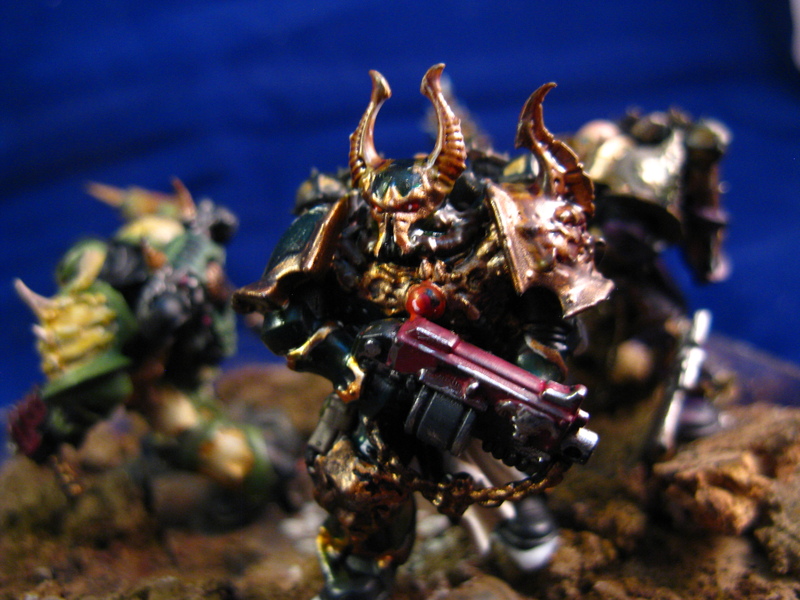 The latest WG Scarab Occult terminators look great, don’t get me wrong, but these guys rock. The whole Egypt theme is taken to the limit with the intricate embellishment of their power armor, and more importantly, the animal-head helms. Even if I did not like the back story of the Thousand Sons this would be a must-have set. They were painted the Thousand Sons cobald color (which is not really cobald), and used AK Interactive’s True Metal gold and brass to paint the gold parts. The intricate patterns meant lots of fixing errors… I chose not to paint the tabards. I don’t particularly like the idea of loinclothes on a power armor, plus I was getting to the end of my ropes with the figures. Nevertheless I might come back later and paint them. Again, my skills as a figure painter are not exactly stellar, but here you go. At least there’s a lot of room for improvement. Competition is good is what I’m trying to say here. The name itself of the character is full of meaning; Ezekyle (Ezekiel) and Abaddon are both important characters in the Bible. Enter Grim Skull Miniatures. 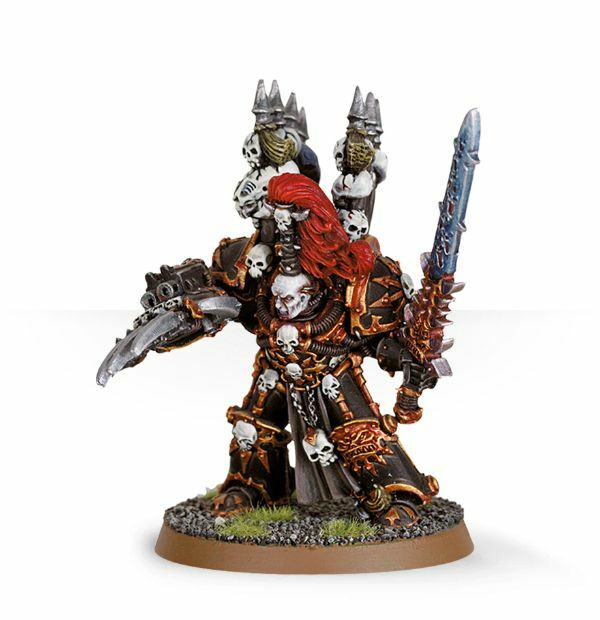 They first came out with a 28mm model who is not Abaddon, of course, but fits the archetypical Abaddon image with the Talon -the power claw of his father, Horus-, the daemon sword Drachn’yen, and his usual topknot that he is known for. 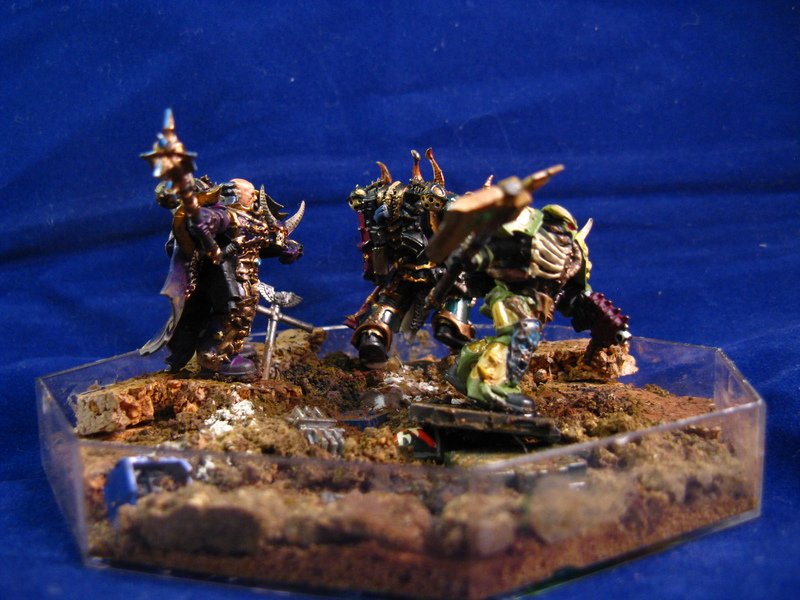 A 54mm version of the miniature features a Mohawk instead of a topknot, and it is substantially larger… had it been issued when I bought “my” Abaddon, it I probably would have bought that instead of the original version simply because of the amazing detail comes out better in the larger figure. (It is on my wishlist, but I’ll probably have to pass on it; after all I just had a daughter. The days of spending on hobbies are behind me.) I’m not sure why this Abaddon features this hipster haircut. It is possible that Grim Skull realised something about topknots writers and artist should have at Black Library long time ago: you can’t shave the skull and have a large topknot, as Abaddon supposed to be doing. All that hair has to come from somewhere; and unless he has exceptionally dense hair, it is not a realistic option to have the rest of his head shaved. The power armor is incredibly well detailed, and only someone with much better skills than mine can bring out the maximum out of it. The ornamentation is well done, the armor has a lot of cracks and battle damage…It perfectly re-creates the various artworks of him as the Second (and true) Warmaster. The facial expression is pretty good, too; he looks “changed”, he looks intimidating, but not totally twisted; his features retained enough of his humanity not to make him look like a simple screaming monster. The daemon sword looks very much like the pictures of the weapon on various artworks; painting it to look good is not an easy exercise in layers upon layers of glazes. He has a loincloth for whatever reason, which is an incredibly impractical thing to have on an armor (alongside the tabards various Astrates chapters prefer). Besides getting caught in, well, everything, it gets dirty very fast, and it will also get destroyed in the first few seconds of action. (I tend to leave it off in my figures for this reason.) Replacing it must be a constant choir, but I’m not going to judge his fashion sense. The trophy racks on his back sport skulls (but no helmets); all in all, the figure is an excellent rendition of the Abaddon we see on the paintings. The eyes were painted gold (since his eyes were supposed to be bleached gold for staring into the Emperor’s light), but this does not really show well on a figure; the skin is too light for that, and the eyes are too small -there is not enough contrast. It would look better on the larger figure. The bronze edges were done using AK Interactive’s True Metal gold. The sword was painted using various shades of purple and blue in thin glazes. The trimmings on the armor were painted in various shades of gold and bronze. I positioned the sword in a slightly different angle – it makes the pose look a bit more natural than if he held all his weapons at a chest height. 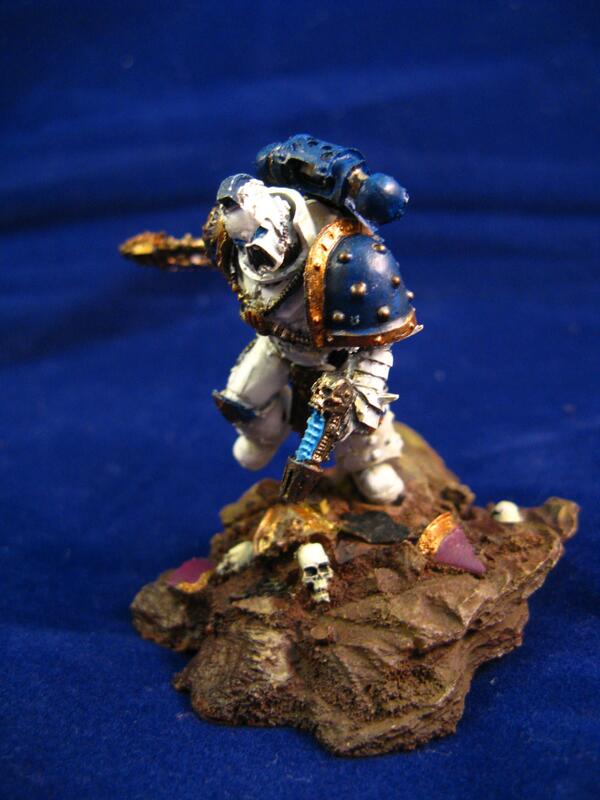 All in all this is an excellent miniature. There is a small cottage industry focusing on producing figures and other accessories for popular tabletop games. Warhammer 40K is no exception. One prominent company producing resin alternatives and conversion sets is Grim Skull Miniatures; their Hive Bringer (khm… Tyhpus) is the subject of this review. I mostly choose characters with interesting, intriguing fluff, but honestly Typhus is a d”ck, and there is no way around that. The miniature looks awesome, though, so in my shopping basket it went. 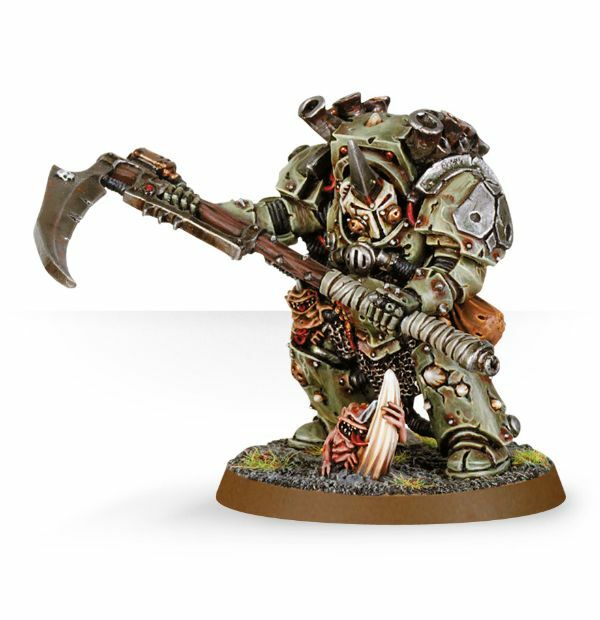 Games Workshop has a newly issued (plastic) chaos-corrupted version of Typhus, so there are definitely choices out there. Their Typhus looks really nice, but I really can’t be bothered about the silly little deamons crawling all over him… I mean I know it’s a silly table top game, but there must be some limits. This particular figure by Grim Skull is absolutely gorgeous. He holds either a scythe or two sickles (these held in reverse, John Woo style), and he definitely looks corrupted. The detail and definition is simply superb. All the cysts, boils and blisters are lovingly re-created, alongside with the horns sticking out of the cracks of his power armor. 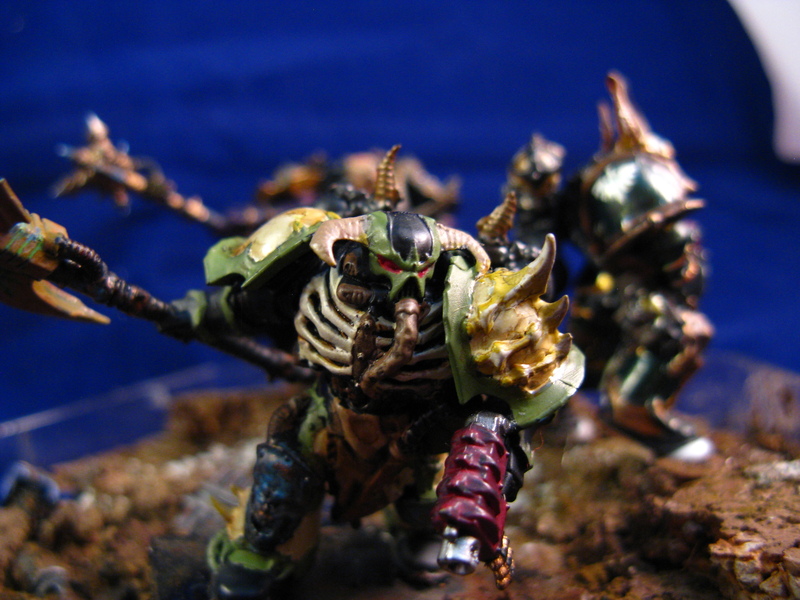 The figure comes with a base which is similarly well detailed with the assortment of maggots, skulls and horns. The assembly is a breeze; you have to attach the arms, the shoulder pads and the weapon(s). If you elect to use the sickles, the position of arms is less than important; however to line up properly with the scythe, you have to be very careful to make sure the arms are in the correct position. The really cool part- at least I found it fascinating- is that one of Typhus’ hands is bare… you actually get to see the skin of a corrupted daemon prince under the armor. As with most figures, painting is the difficult part- and I do admit I’m not an excellent painter. (My main interest is armor models). I found that glazes are great to produce an uneven, dirty and grimy looking surface. Previously, with Mortarion, I used glazes over black primer; this time I decided to use a similar approach over white primer. I used several shades of brown and green glazes (prepared using Lahman medium and acrylic paints) to give the armor a stained, corroded look. The parts of the armor I wanted to appear bronze received a green base; I chose two green colors that are close to the color of oxidized bronze. Later on I realised I should use a dark, metallic tin color, and layer bronze and oxidised bronze colors onto it. The blisters and pustules were painted with a yellowish/pinkish color, and received several orange-ish/reddish glazes; it managed to convey the inflamed, blistered, sick skin. I used some Vallejo diesel fuel stains and engine oil to simulate stuff leaking from our corrupted Astrates. 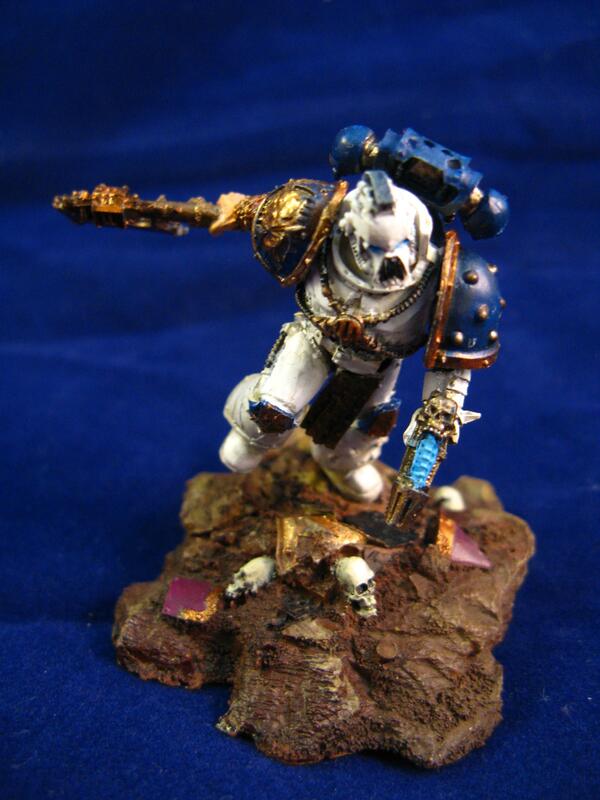 In short, this is a great looking miniature. I do not play WH40K, but I do enjoy occasionally paint the minis I find compelling. Some I want to paint because I like the character’s back story, and some, because they look cool; Typhus belongs to the latter group. Warhammer 40K. The picture above will make it clear why. There are enormous gaps in the “official” miniature offerings in the available fractions, and also what is available tends to be somewhat expensive. A lot of smaller companies spotted these gaps on the market, and started to produce similar-but-not-quite-the-same miniatures that are not available from either Games Workshop or Forgeworld, usually for a friendlier price. 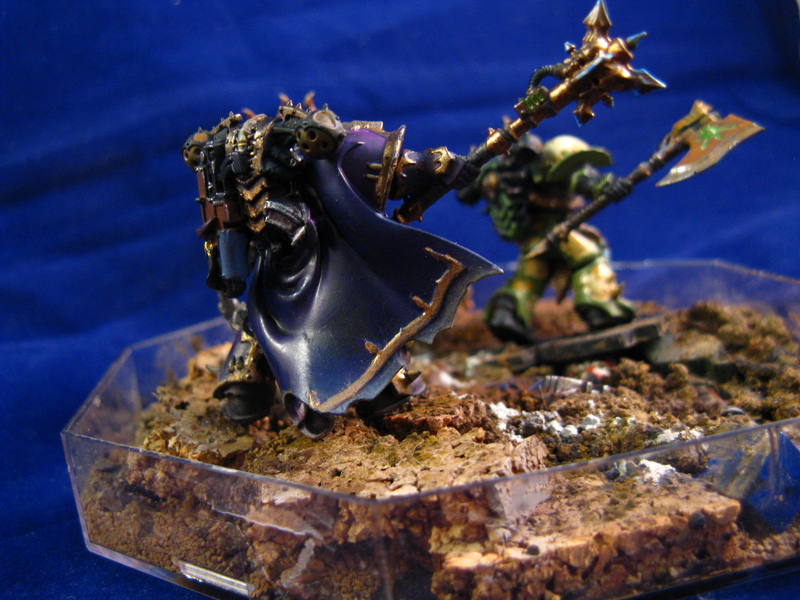 Mortarion did receive an official figure by GW, and another by Forgeworld, but I did not like either of those versions. The WH30K (pre-Heresy or Herey era) Forgeworld model did not really resonate with me, and the daemon prince figure looks very different from the man he used to be, twisted and bloated beyond recognition. In case of Mortarion it is an issue. True, the Primarch of the Death Guard Legion had fallen to Chaos, and has been turned into a Daemon Prince since the Horus Heresy. However the lore makes it clear that he is the one Primarch (alongside with Magnus, possibly) who remained as close to human as possible. Grimm Skull Miniatures has issued a Mortarion model that can be used both as a pre-daemon prince Primarch before or during the Heresy, or as a full-fledged daemon-prince (essentially the same figure plus two big, leathery wings). Yes, you can say it’s just lazy marketing. 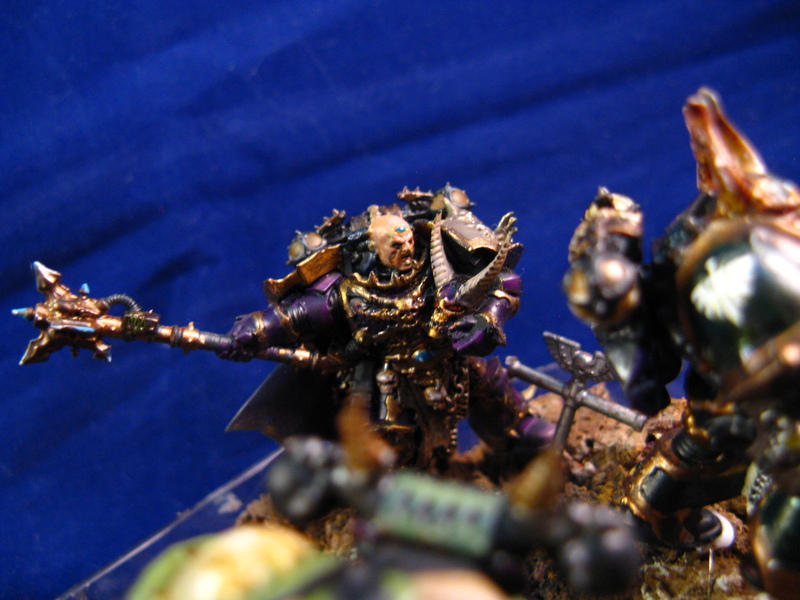 However since he is the most human of the daemon princes, and fans still debate if he could even return to the side of the Emperor again, as his red brother did, there IS a good argument for Grim Skull Miniatures’ choice. 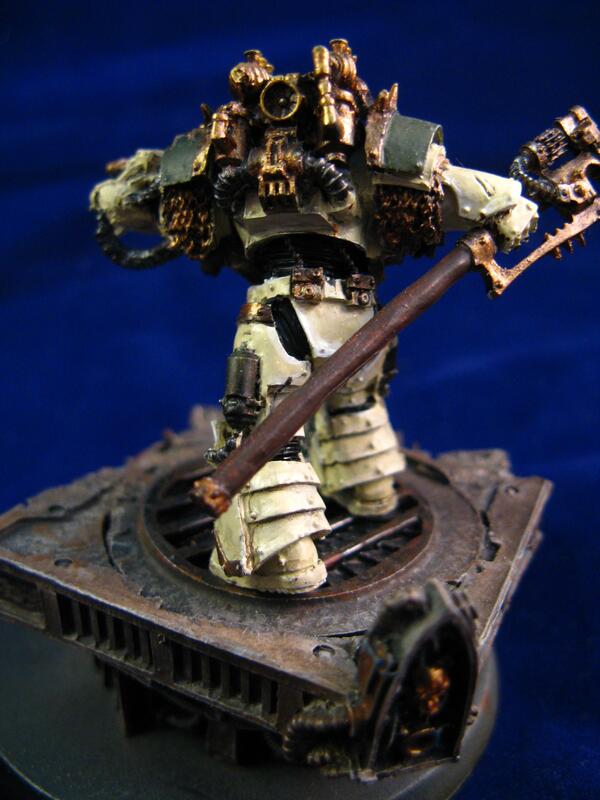 Mortarion, or Morty for his friends, looks exactly like his description in the Horus Heresy books. A gaunt man in an ornate, baroque power armor, with a cape covering his head, and censers hanging from his armor on chains. He has his power scythe Silence, however he does not have his handgun, Lantern. 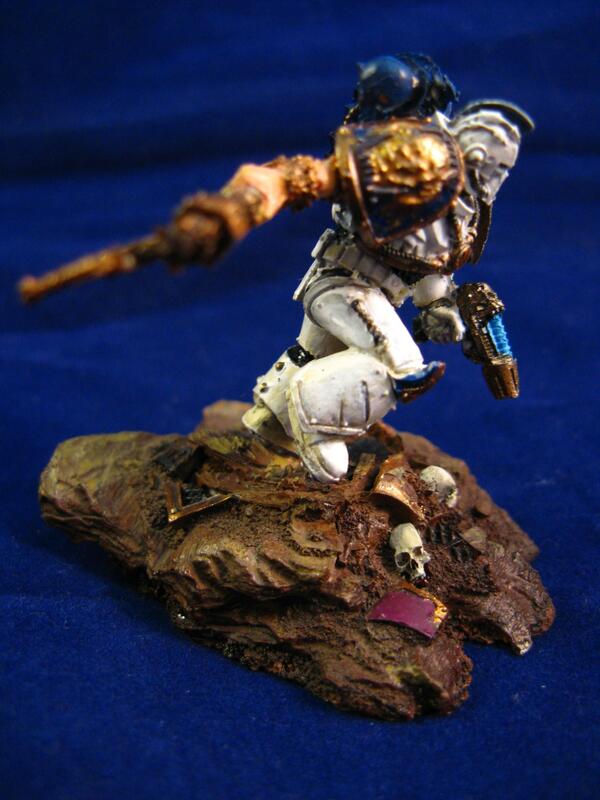 This is a glaring omission of the model; the gun is a prominent feature of the Primarch. Otherwise I do like it better than the pre-daemon Forgeworld figure, or the daemon prince GW model; he does radiate a sort of dark, solemn majesty with his ragged wings and elaborately decorated, corroded armor. He comes with a pretty nice base to stand on with a broken pipe leaking who-knows-what. (It must be something corrosive because there is a skull in it.) We do get two such pipes; I used the extra with another Death Guard figure. The big issue, however, was the wings. There are simply no attachment points where they can be glued to, and the surface touching the back of the figure is so small, it was difficult to secure them even with small wires drilled into them. The painting stage is usually where these models are made or ruined, and I have to confess I’m not a master painter. My main interests are armored vehicles, so my skills at blending and painting small details by brush leave much to be desired. I don’t particularly stick to the “Games Workshop School of Figure Painting” with the high contrasts and very fine layering/glazing, either. Since I have the daemon prince version, I did not paint him in clean, pre-Heresy colors; he got the full grime, rust and corruption treatment. I used Vallejo’s black primer as a first coat, and used Lahman medium to create glazes in various browns and greens. I kept adding the glazes in very thin coats until I liked the greenish-brownish hue. 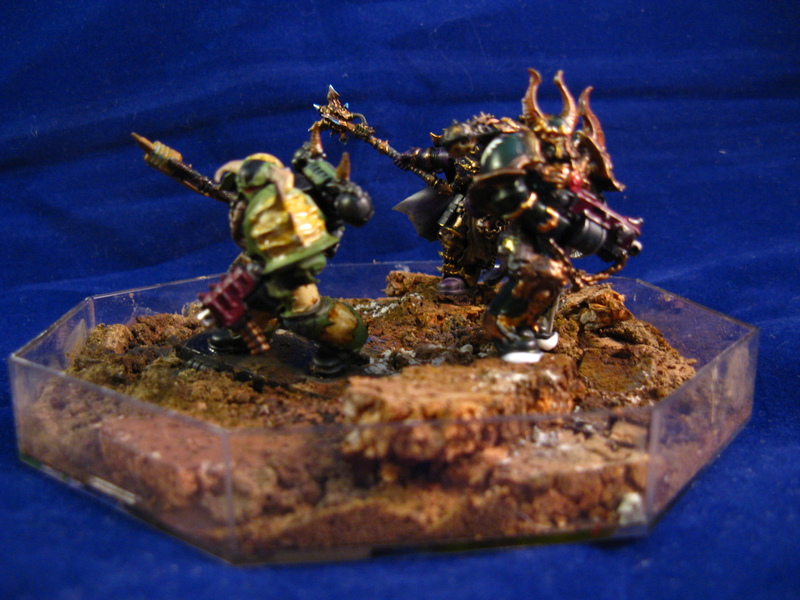 The bronze parts were painted using True Metal gold first (on larger surfaces I dry-brushed it on to keep the black as shadows in the recesses), and then followed it with several layers of oxidized bronze green colors as glazes. As finishing touch I reapplied the gold on rivets, thin edges, and other surfaces where the oxidised metal would be rubbed off. The different pipings on the armor were painted with dark blue glazes to create a slightly different color without too big of a contrast. I was uncertain of what colors the wings should have: they look like a cross between an insect’s wing and a bat’s. I did not want them to stand too much out of the general effect, so they got mostly the same treatment as the rest of the figure. The wings received a purple glaze, and the insectoid wing structure was shaded with ochre and brown oil paint blended into the base dry; it does look slightly iridescent and chitinous. The tabard/cloak Morty is wearing got a similar layering treatment, only in this case I used a white base and added mostly brown colors. 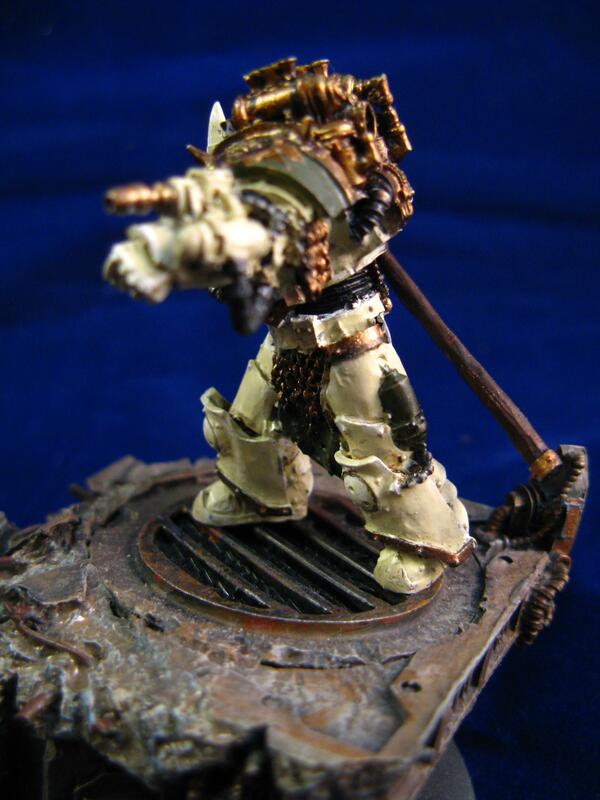 As a chaos prince of Nurgle, the god of disease, he can’t really be expected to have a spotless, white attire. (Having one at all is pretty silly since it would get caught in everything and anything.) I added further highlights, shading and discolorations using oil paints. After weeks of drying it is still somewhat shiny… This is a good lesson on getting out the linseed oil out of the oil paint before using it. (Just put a blob of paint onto a piece of cardboard and wait a few hours… Next time I will not skip on this step.) Right now I’ll go with the “can’t you see it’s leather? ?” defence. It turned out a bit darker than I would like, but there it is. As I said I’m not the best of figure painters. The base was painted similarly to the figure: several layers of dark grey and brown glazes over black primer, then a little steel and gold True Metal paint drybrushed on here and there. The rubble got a bit of a rust and dust pigments, and the bronze areas got the same treatment as Morty’s armor. Another old build finished… This is the model of a 75mm light infantry howitzer used by the German army. The model is quite hold- it’s older than I am in fact, from 1976. I got it as a present from a friend years ago, back in the US, started to build it halfheartedly, and put it away in 2009 half-finished when I moved over to the UK. It was made of cheap-looking bring green plastic (similar color to the Army Men toys), and was not exactly inspiring me to finish it. It received a panzer grey coat, and that was it. It’s incredible how much presentation matters with models. The “Eastern European” 1/72 kits (UM, Attak, etc) look pretty shabby and amateurish unpainted. Flash everywhere, the plastic is not the best, the attachment gates are thick… and usually the plastic has weird, uneven colors – nothing to drive you to press on with the build. Case to the point: my KV-2 build. It had a strange, toy-like feel to it unpainted, but once I applied the primer coat, it’s all gone, and suddenly you have a pretty detailed model in your hands. Whereas a professionally packaged kit with crisp details and good looking instructions can just make you want to drop everything and start building it. I might be shallow, I know, but presentation matters. I dug it out three years ago from a box in my mother’s attic; by that time one of the wheels broke off. I brought it with me to the UK, but it was kept in a box forgotten and unloved. About two months ago I got fed up with stalled projects; so the SiG got a new lease in life. Since it was the quickest to finish, I thought I’d start with it. I drilled a hole where the wheel axis was, re-attached the wheel with an evergreen plastic rod, and started weathering the gun. It’s not a very detailed model (the breach assembly, the optics are very much simplified), but it’s detailed enough. First step was a couple of light coat of blue filter; which was followed by some dark brown pin washes. Once everything dried I added some lightened base-coat to the raised details and edges as highlights. I tried a couple of AK products on this build; after all this seemed like an ideal opportunity to practice – if I improve the looks, fine; if I mess up the build, then that’s fine, too. I did some streaking using different streaking products. Add a dot using a small brush, and used a moist (almost dry) wide brush with downward motion to form the steaks. I also added rust-streaks with the same method. I also added earth effects to the bottom of the gun shield and the carriage. I was reluctant before to use this particular product, as the contrast seemed high when I applied it. Once it’s semi-dry, you can (and should) remove, adjust the pigments with a moist brush. After drying the contrast will be much smaller, and the effect more realistic. I also tried some of the dust effect products around the rivets and whatnot; they work reasonably well. To be honest using oil paints and pigments diluted with alcohol/white spirit/water is still a better option, but I might just be too old school for this. As finishing touches I used Tamiya’s make-up set to add more dust and some metallic shine to the gun. Thypon (or later known as Thypus) has, however, never been a nice person. Always arrogant, always sneering, always self-righteous; it’s hard to find anything likeable about the guy. (He does sport some amazing beard, though.) Let’s face it, he is somewhat of a one-dimensional anti-hero. Nevertheless, the Forgeworld figure is just incredibly good-looking. The heavy stride of someone in heavy a Terminator armour captured incredibly well. You can hear the footsteps, you can feel the tremor of the earth, and you can clearly see that this armour was not designed to be jogging in it. 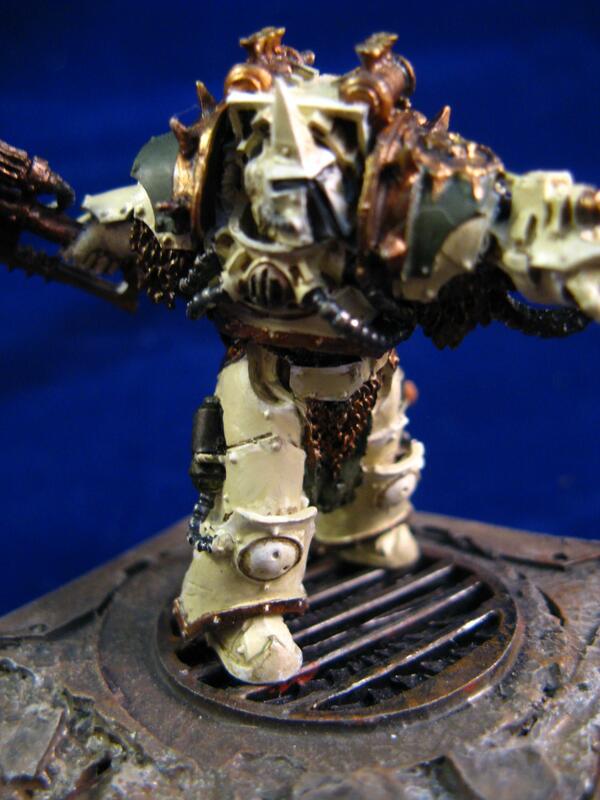 It also looks pretty realistic; my biggest issue with older iterations of Terminator armours is that they look unwieldy; just look at an old Games Workshop Abaddon figure to see what I mean. He literally is forced to keep his arms up in a threatening pose, because he cannot physically bring them lower towards his torso. (Which is good if you want to threaten someone, but bad, if you want to actually do anything else. Like moving.) The new Forgeworld Terminator figures -while it’s clear that the wearer will not do splits in them any time soon- look more realistic as power armours go. The kit is also a good starting point for the character himself. 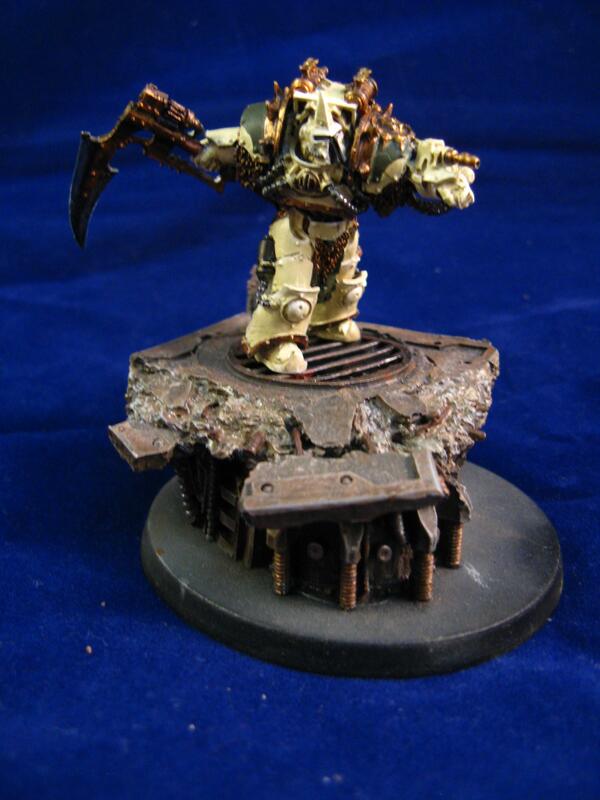 This is the original state from which he got corrupted into a plague Marine, harbinger of disease and corruption. Citadel Finecast did come out with a Chaos corrupted Typhus before, and you can see the similarities between the figures. The sculptor at Forgeworld used this figure as a basis, and he made an excellent work. 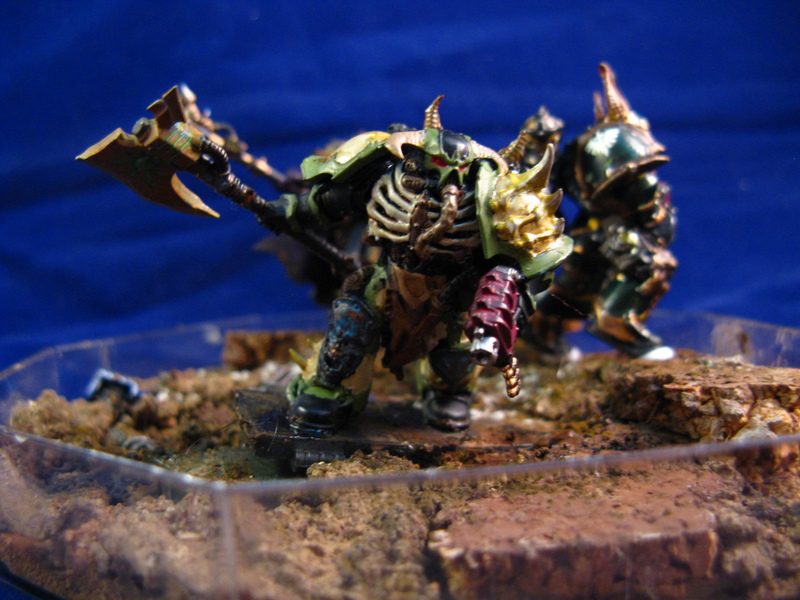 Since the Death Guard is under the influence of the Lord of Decay, Nurgle, they are quite foul creatures. I tried to depict the beginnings of receiving the favours of this Chaos god might look like: the originally granite-grey armour got a yellowish sheen, representing a thin layer of filth, quite possibly excreted by the amour itself. He has made his first step in the path of corruption. I’ve also used transparent paints I use normally to simulate fuel stains on tanks. One brilliant thing I realized was that the usual problem with washes (namely the wash dries in a way that the pigments in the wash flow towards the edges of the wet area away from the cracks, which look bad if you use the wash to accent shadows) actually look pretty on-spot with Typhon -after all, his armour does excrete some foul substances, which will dry in patches on the surface. To be honest, the base caused the most problems; I just could not get the colors right. I tried different greys to depict the broken concrete, but it just did not look “real”. The breakthrough came when I realized that the “right” look can only be achieved using layers and layers of different grays and browns. I’ve kept drybrushing with different colors (metallic colors included at places), using different highlights, adding filters, washes and pigments; after about a month of working on it on and off, I decided it looked good enough to stop. His character in itself -along his friend, Argel Tal- is one of my favourites. Kharn knowingly slides into corruption because of his loyalties. He is a noble warrior (as far as any Astrates can be noble; let’s face it, all of those guys are kind of dicks), who somehow retains fragments of his nobility even when he turns traitor. You can understand why he betrays the Imperium, and to be honest, he kind of has a point, too. He is aware of the corruption as it happens to him, and this makes him cynical and disillusioned, as he knows he has no choice in the matter. All of his choices were taken away from him by the Emperor of Mankind (who is either incompetent or just plain stupid), and his damaged Primarch (who should have been put down as soon as he was discovered for the good of everyone, himself included). 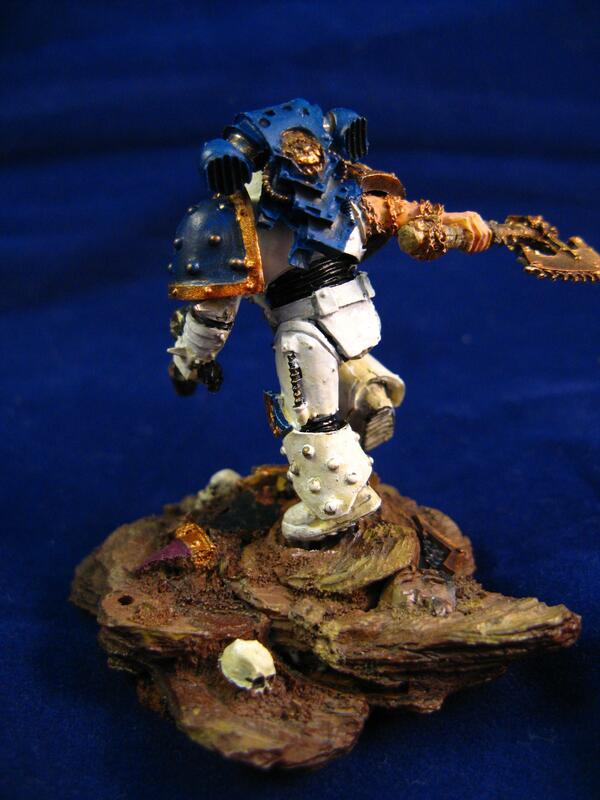 This is my second foray into the world of Chaos Space Marines. This little diorama was created to provide a safe base for the Dark Vengeance Astrates I have got from Ebay, using a Rocher Ferrero box as a display case. I did not really have a concept in mind aside from depicting the characters as advancing on an unseen foe. (This was due to the small size of the box; had there been more space available, I could have put in a dreadnought or an Ultramarine Terminator as an enemy to advance upon. (I did buy a couple of models off Ebay over the last couple of years, but only now have I started to actually finish them properly. A lot of the models I got needed extensive surgery or their paintjob stripped, as I got them cheap and used, which hindered the work. Mostly due to my laziness, but still. Buy new if you can help it.) The other big push to actually start taking painting WH40K seriously was the fact that my landlord was giving up the hobby, and he sold me his paintset for ten quid. And we’re not talking about the starter set… we’re talking about a HUGE box of paints, washes and inks. I started to watch videos about blending, how to paint fabric, and all the other tricks of the trade – so I found these little figures a welcome variety from the dull-colored tanks (and they look awesome in general). Anyhow, here is the second box of Chaos. The figures themselves are brilliant: their poses are very dynamic, and the details are just amazing. The only issue I had with them was the seam lines which were sometimes on very visible- and hard to reach places. Most of them were filled in, but I’ve left one or two untouched because I was worried about the potential damage to the surrounding detail. Since then I got a bottle of no-sand putty from True Earth; this should help next time. I tried to give these guys some justice (since they got none from the Emperor…), but this is how far I got. The Emperor’s Children warlock (I think… that third eye must be a sure sign of psychic powers) got completely dark eyes – ever since I’ve read about Daemonhosts in the Eisenhorn trilogy I liked this idea of the absolutely black eyes without the whites around the iris. I guess it’s not far-fetched to imagine a sorcerer who is possessed by a daemon, so this works out fine. The only thing I forgot to do before taking photos was to apply some matt varnish to the cape; it is too shiny to be a convincing fabric. The most loving care was given to the Death Guard with his axe. His armor is probably not going to be shiny and clean; but I did not want to go for the full-on “puss filled boils and rust” look, either. I made him unclean looking using some oil washes, and the “fuel stain” product from AK, and used different browns, reds and organges to make his axe rusty-looking. The Dark Angel was the less inspired of the three, as I don’t know much about these guys yet. The whole paintwork started by priming him black, and then trying my hands on the Citadel line of inks – it worked well to produce a deep dark-green color. The orange gem on this chest does need some work yet, I admit. I used some pigments on the boots and fabric to depict dirt -after all, they are on a muddy battlefield-, and called it a day. The diorama base was prepared the same way as the previous one -using cork as pieces of rock/concrete buildings (at this stage it’s uncertain), and weapons and armor pieces from the spares box to add some variety. I ended up using actual earth mixed with white glue as a base with different shades of pigments sprinkled on top.